Happy Valentines Day to everyone! I'm spending the day with all of my sweethearts. I was woken up by my darling kitty, Gypsy. I'm enjoying the day with my sweet kids and when Pj gets home from work, we're enjoying the evening at home, all 4 (5 including Gypsy) together. We never go out on V-day. It's just a mess. V-day in St Louis is always freezing cold, often snowy and not worth waiting an hour and sitting in a crowded restaurant to eat. Instead, we stay home, cook or order out and watch romantic comedies while lounging in our snuggly pajamas. 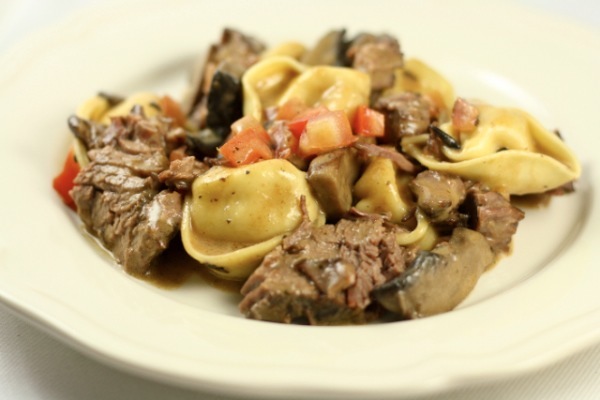 This year, I'm making one of my favorites, Olive Garden's Braised Beef with Tortelloni. The boneless spareribs simmer in the crockpot with marsala cream sauce all day and by the time dinner rolls around, the meat melts in your mouth. It's served with cheese-stuffed tortelloni and is divine! I really think that The Little Kitchen's recipe is even better than the stuff at Olive Garden. This afternoon, I'm watching some of my favorite romantic comedies on Netflix while I work on vintage repairs. Marilyn, Lauren and Betty. Does it get any better? This one is great for the fashion and romance but so funny that it even made my husband laugh. I love Barbara's sassy attitude in this laugh-out-loud black and white flick. She's a showgirl running from the mob and Gary Cooper is a professor who needs to hear what street-talk sounds like so he can complete his encyclopedia entry for slang. I hope that everyone has a lovely Valentines Day and gets to spend a little time with their sweetheart, be it a beau, a fur-baby or dear friend. I love Ball of Fire! One of my favorites! I also like A Song is Born, but Ball of Fire is the best :) Enjoy what sounds to be a wonderful Valentine's Day! Sounds like fun! The hubby and I went out last night to avoid the craziness of the day of. Happy Valentines Day to you! Sounds like a wonderful day you've got planned. Ball of Fire was a great movie, I'll have to re-watch the others, it has been a long time since I watch them. 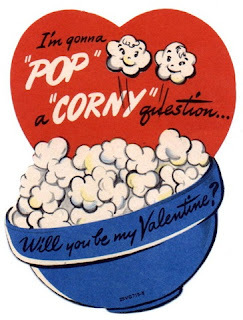 Sounds like a wonderful Valentines day for you and your family. Happy Valentines day! Movies and dinner in your pajamas sounds like a perfect Valentine's Day to me! Gentlement Prefer Blondes is one of my favorites, too. sounds like a perfect valentines. we really don't enjoy being in an overcrowded restaurant on this day either. Sounds like a lovely valentines day! Love those first two films but I've never seen Ball of Fire so that is on my list to watch now! Sounds like you had a lovely day. I totally understand how staying in can be much more peaceful than going out and fighting the crowds! I love Ball of Fire but I really liked the remake with Danny Kaye and Virginia Mayo...the music in the remake was just out of this world! Sounds like you had a great day.